Should cyclists be allowed to go two-ways on narrow one-way streets? IMAGE: No entry except bicycles signs are the most common cycling signs in some European cities.narrow streets without any cycle lanes. 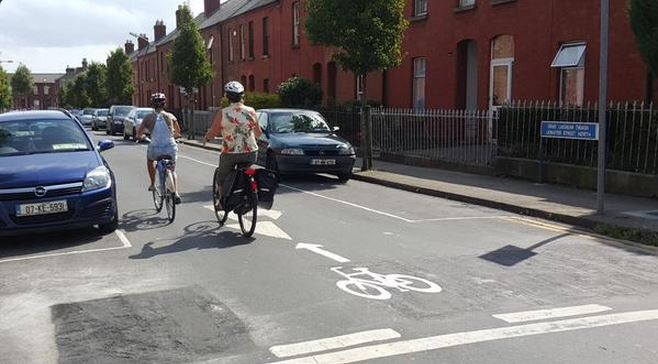 COMMENT & ANALYSIS: Phibsborough in Dublin is now effectively the testing ground for two-way cycling on otherwise one-way streets (aka contra-flow cycling) on narrow streets without any cycle lanes. Contra-flow measures allow people cycling to legally go two-ways on otherwise one-way streets. There’s a few ways of implementing contra-flow cycling — over at irishcycle.com/contra-flow there’s an overview including local examples. Back in Dublin, there’s also a long-standing example in Phibsborough on the Royal Canal Bank (a street is named after a long-filled in branch of the Royal Canal which used to run down to Broadstone). This is once of such long-standing arangments, the other two are on quite streets on south side. This writer had the privilege of using this example regularly when commuting from DCU into the city centre and later when living in Glasnevin and commuting into the city. We’re not sure when the Royal Canal Bank example was put in place (answers on a post car please! ), but it is likely in place for at least 10 year at this stage. But as we reported last year, there’s a new kid on the block or, more precisely, on in the block on the other side of the Phibsborough Road — on Leinster Street North, which is also in Phibsborough. The council are using a long-standing legal framework which allows this set up (effectively the street is not a totally one-way street but at one end it’s no entry except bicycles. In Irish law it also seems to only work with the old-style no entry signs, not the continental-style ones which were rolled out in the last few years. Overall the council seems happy with its examples in places, the bulk of councillors are in favour of it, and local and international examples are proven to work. There’s no safety issues which can’t be overcome, and this type of contra-flow is a basic pro-cycling measure in most cycling-friendly towns and cities which have narrow one-way streets. So, why has the Department of Transport for years resisted greater roll out of this contra-flow? Why has it not just added it to its manual for road signs? Or, if any law tweeks are needed, why have they not pushed ahead with such reforms? Cian, having contacted DCC back in September 2008 after they made Royal Canal Bank one-way, they agreed to add an Except Cyclists sign to the No-Entry sign. They later agreed to a similar addition to the No Throughway to NCR sign on the junction with Phibsborough Road but this subsequently vanished. I have contacted the Cycling Officers on a few occasions since about drivers not being aware that cyclists are allowed two-way access but have never ever received a reply. I do feel that some of the very close passes (and dirty looks) I’ve experienced are because drivers assume I am another law-breaking cyclist. Unless they look in their mirror after they pass the No-Entry sign, they cannot know otherwise. 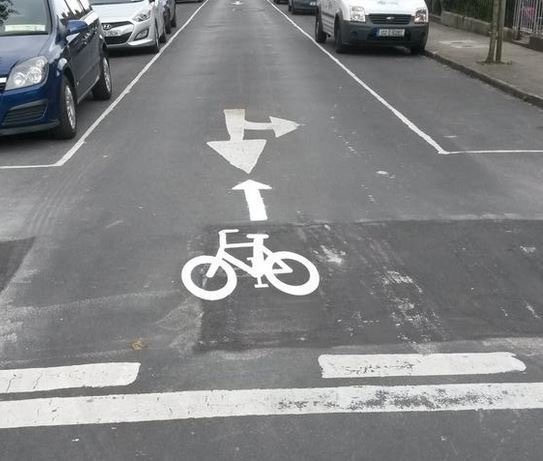 Simple road marking and signage as used on Leinster Street North would hardly break DCC’s budget. As a piece of recent news on this issue from Galway City. The last two Galway City Development Plans (2004-2010, 2011 – 2017) included this objective “Implement two-way access to cyclists on one-way streets where feasible”. This wording was voted into the plan by the 2004 council against the resistance of the city officials. The next City Development Plan (2017-2023) has been going through the drafting process and the city officials removed this objective from the plan under discussion. A submission was made proposing that this objective be reinstated. This was rejected by the officials on these grounds “No amendment to the Draft Plan is recommended in relation to access of cyclist on one-way street as this requires national legislation and NTA guidelines” (text taken from the Chief Executive’s Report). The City Officials are also taking the position that the Development Plan process does not provide for “right of reply” on how public submissions are treated in the Chief Executive’s report. This position has apparently been accepted by the current group of councillors. They voted to accept the official’s proposed wording last Thursday 1st December without accepting any further submissions from the public. There is only one way to make it work so motorists get used to cycling in both directions in one way streets for motorists: make it the rule not the exception. It works in Belgium (where I am from) in all cities so why not here. We could have had that all over the city but Sinn Féin’s Críona Ní Dálaigh, who was Lord Mayor at the time, used her casting vote to prevent it when it came up for a vote of Dublin City Council.